Second image for my class I contracted on self-portraiture and anxiety. When I become anxious, it over takes my body with its tendrils snaking through my every fiber. I become paralyzed and self-contained. My mind battles with itself. I seek questions, I seek answers, I seek resolution, but all that I say is administered through a clouded mind full of static, rolling lines of color, and grain images that I can only see vague shapes in. In truth, I am probably best alone when my anxiety is amplified – it never ends well and only a pixelated, fragmented version of my self is available to those around me. I never really stop to ask – how is this affecting others in the immediate area? Those who are there for me, those who are not, those who are present, those who are absent? This piece is my attempt at understanding that. By placing myself in front of a TV what was originally projecting the color bars ranging from white to yellow to cyan to green to magenta to red to blue to black, I became a static figure in front of a static unmoving object symbolizing a seemingly infinite symbol of colors. 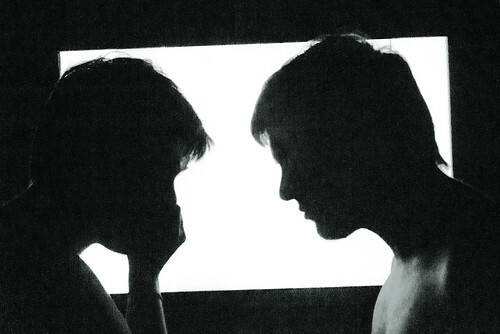 By turning them black and white, though, the figures are presented in front of a mostly white screen and are silhouetted and they become faceless. These two characters showcase my intent to become both the victim of anxiety and the person attempting to console. In doing so, I believe that a sense of hopelessness occurs because it is up to the viewer to discern between the figure who is anxious and the one who is not. When I originally was creating the image, I had a clear idea, having been the model and on body language, of which was which, but upon piecing it all together, I believe it can be interpreted either way. Facebook page . There is a before there.